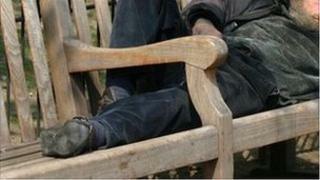 Nearly 60 people have been found by a charity sleeping rough or in makeshift shelters in Cornwall in one night. Staff and volunteers from the St Petroc's Society counted 59 people when searching coastal paths and fields from 20:00 GMT until the following morning. Steve Ellis, from the society, said they tried to cover as much of the county as possible. He added the charity had started its winter 24-hour open door policy. In November, the charity had estimated there to be about 50 people sleeping rough each night in Cornwall. Mr Ellis said the count had involved staff and volunteers working along routes including from Bude to the Lizard and from Saltash to Penzance. He admitted that, despite the count and other work with Cornwall Council, they were not exactly sure what the total figure was. He cited one example of a man who was found by him on a farm near Bude. He said: "He was in a disused farm building with a collapsed roof. "When we first arrived, we heard rustling which we thought was our client, but it was vermin. "It was quite frightening, it was pitch black, and we only had a small torch. "The farmer had allowed him to use the building and was hoping to feed him. If it hadn't been for that, I'm not sure what state he would have been in. "In 2013, even for people who work in this field, I'm not sure if I'm embarrassed or ashamed - just as a human being - that this was the only shelter he could find." More help was found for the man on the farm later, he added. St Petroc's Society was formed in 1986 offering support to homeless people in Cornwall.